When NASA's New Horizons Mission lifts off for its 10-year voyage to Pluto, it will have already completed the first--and likely most harrowing--half of its journey. It's been 17 years since lead scientist Alan Stern began advocating for a close-up look at what was then the last unvisited planet. New Horizons' odyssey is brilliantly chronicled in the program "Passport to Pluto" currently running on both The Science Channel and NASA TV. But "Passport to Pluto" offers much more than just an incisive look into the often-convoluted workings - and engaging personalities - of a modern space science program. This remarkable show flies out far ahead of the probe itself, giving viewers two critical insights into the "third realm" of the Solar System: We gain clear understanding of why discoveries to be made out there in the Kuiper Belt could fundamentally change what we know about our origins. And we experience a deep gut-feeling for the odd conditions on and around these hard-cold, yet surprisingly dynamic, "dwarf planets"; worlds whose total number we can now only begin to guess. Throughout the program, artwork by Ron Miller, Dan Durda, David A. Hardy and Mark Garlick illuminate what human--and robot--eyes have yet to see, so far from the Sun. 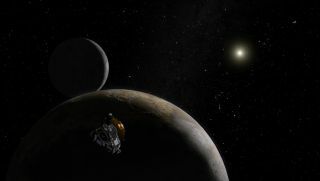 "Pluto is an even more interesting place than we imagined," says Hal Weaver who, along with Stern recently discovered two new additional Plutonian moons while using the Hubble Space Telescope to fine-tune New Horizons' flight profile. Hints of what lies on its mysterious surface are revealed for the first time in this show, animated in true color by astronomer Marc Buie. Since the early 1990s (as astronomers fit more telescopes with CCDs and software) the catalog of Pluto-like orbs has been piling up. And whether you call them planets, Kuiper Belt Objects, ice dwarfs, or "killer comets waiting to happen", these objects are certain to surprise us when we finally get to see them up close. "Virtually every place we have sent a spacecraft on a first reconnaissance mission like this." says Stern, "we find out that out Earth-based notions were flat wrong." Writer, Director, Producer Geoff Haines-Stiles, whose science television credits include "Cosmos" with Carl Sagan," "Creation of the Universe" with Timothy Ferris and "Search for Signs of Intelligent Life" with Lily Tomlin, immerses us in this often-emotional quest for quality science. This show has it all: first person recounting of Pluto's discovery with Clyde Tombaugh; Jim Christy's surprise uncovering of Pluto's partner Charon; the discovery of a new planet with Mike Brown. We also see the actual instant when Pluto's atmosphere reveals itself to scientists; the rescue of Pluto exploration by popular outcry begun by 17-year old blogger Ted Nichols; hurricane Wilma's impact on the mission. And a cliff-hanger: If New Horizons gets clear of Earth; if the flight trajectory is perfect; if no design flaws, engineering errors or fit-up foul-ups have slipped by; if ten years of flight time into the cold dark depths don't take a toll... The spacecraft will only get a few hours of science at Pluto on a single day in July of 2015. "This is going to be incredibly nerve-wracking," says Hal Weaver, "terrifying...and also very exhilarating." Watch "Passport to Pluto" and you'll live through the nail-biting moments of a critical "sim" as the data acquisition team tries to stay sharp for a date with destiny a decade in their future. What began as a race against time to get to the "last planet" before its atmosphere freezes out onto its surface, now approaches perhaps its most agonizing moment: Launch! And when the booster engines ignite, New Horizons will really haul potatoes; a kick to the hardware of 13G's; the fastest departure from Earth of any human-built object. It'll cross in only 9 hours the distance traveled by the Apollo crews in three days. "We built a very light spacecraft and bought a very large launch vehicle. And the combination is ferocious!" says Alan Stern. It'll need to be. The paradigm-shifting science that's waiting for the team in the Pluto / Charon system is a ferociously long way from home. "Passport to Pluto" will get you there ten years ahead of time.